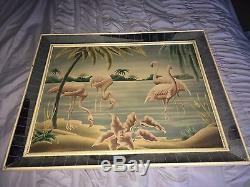 Vintage Mid-Century FLAMINGOS PICTURE by TURNER Wall Mirror. Overall an Gorgeous Mirror that you will love having in your home!!! Measurements: 27 1/2"Tall x 32" Wide x 3. Please keep in mind this is a Vintage piece and has its normal signs of wear. This is what gives it its character and confirms its age. Note: Please use photos as part of the description. 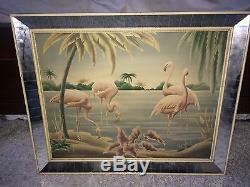 The item "Vintage Mid-Century FLAMINGOS PICTURE by TURNER Wall Mantle MIRROR" is in sale since Wednesday, August 16, 2017. This item is in the category "Art\Paintings". The seller is "brenshouse4" and is located in Roseville, California. This item can be shipped to United States.